Most modern vertebrates have two “lateral” eyes. Some vertebrates, including many lizards, amphibians, and fishes, also have a third “median” eye centered in a hole on the top of the head. 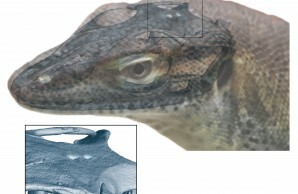 A recent re-examination of museum specimens of the extinct monitor lizard, Saniwa ensidens, has determined that it had an additional fourth eye atop its head, making it the first jawed vertebrate known to have four eyes. The median third eye that sits atop most lizards’ heads is really a light-sensitive out-pocketing of the brain’s pineal complex, which consists of the pineal organ and the parapineal organ—photoreceptors that help regulate daily and annual cycles via melatonin production. As a graduate student at the Yale Peabody Museum of Natural History, Krister T. Smith noticed that fossil fragments of S. ensidens, collected by a Yale College expedition in 1871, contained two holes along the skull’s midline rather than the expected one—a possible fourth eye. 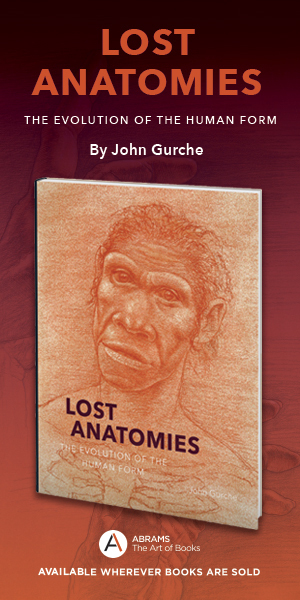 Now at the Senckenberg Research Institute, in Frankfurt, Germany, Smith and three colleagues investigated the fossils more thoroughly. By CT-scanning and casting two S. ensidens fossils, Smith and his colleagues were able to visualize a 3D reconstruction of S. ensidens’s skull that confirmed the presence of a second hole atop the skull, indicating a fourth eye. Their models suggest that the larger median eye, closer to the snout, connected to the parapineal, while the smaller median eye behind it connected to the pineal. In modern lizards with three eyes, whether that third eye is pineal or parapineal is still up for debate. The presence of presumed connections to both organs in the four-eyed S. ensidens is causing scientists to rethink how the median eyes of land vertebrates evolved. Phylogenetic analysis suggests that the fourth eye evolved anew after disappearing in the ancestors of S. ensidens, challenging the suggested “rules” of evolution that organisms do not re-evolve features after having lost them.